Sen. John Kerry says pulling U.S. troops out of Afghanistan could destabilize neighboring Pakistan. Washington (CNN) -- The chairman of the Senate Foreign Relations Committee warned Monday against a narrowing of the U.S. mission in Afghanistan, but also suggested a plan by the commanding U.S. general in the country is overly ambitious. Sen. John Kerry, D-Massachusetts, said in a speech to the Council on Foreign Relations that a major U.S. troop pullout could trigger a civil war between the Taliban and the Afghan government. It could also destabilize neighboring Pakistan, he said. 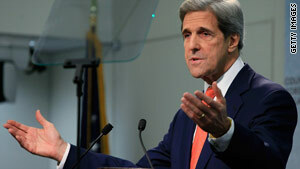 Kerry's warning came during a comprehensive Obama administration review of U.S. strategies in the two countries. Kerry rejected the idea of a small-scale, counterterror campaign advocated by Vice President Joe Biden, saying it was no substitute for the wider, ongoing military campaign. But he also would not endorse a major troop increase as proposed by Gen. Stanley McChrystal, the top U.S. commander in Afghanistan. Kerry said McChrystal's request for 40,000 additional troops "reaches too far, too fast." Kerry just returned from Afghanistan and Pakistan, where he played a key role in persuading Afghan President Hamid Karzai to accept a runoff election after Karzai's recent election victory was found to be the result of widespread voter fraud. By making the case for a middle-ground option -- a limited counterinsurgency strategy with the potential for deploying more troops over time -- Kerry treaded a fine line between fellow Democrats who oppose a greater stake in the region and Republicans who caution the Obama administration risks losing the war. Republicans also have argued that President Obama will put soldiers at risk by rejecting McChrystal's request. Kerry gave cover to Obama as the president considers a greater troop commitment to the eight-year war. Specifically, Kerry said three conditions must be met before Obama decides to deploy more troops to the region. First, the United States needs assurances that there are enough reliable Afghan forces to partner with U.S. troops and eventually assume responsibility for security. Second, there needs to be an increase in support from the country's local and tribal leaders. Third, there should be a civilian surge to match the military increase. "Under the right circumstances, if we can be confident that military efforts can be sustained and built upon, then I would support the president should he decide to send some additional troops to regain the initiative," Kerry said. "Absent an urgent strategic imperative, we need a valid assessment by the president and other appropriate civilian authorities -- not just the military -- that those three conditions will be met before we consider sending more soldiers and Marines to clear new areas." Kerry's assessment of the Afghan government's ability to partner with American officials was grim. He said, among other things, that the United States does not have the "critical guarantees of governance and development capacity." "Deploying additional troops won't result in sustainable gains if the Afghan security, civilian and governance capacity isn't there," he said. "And right now, as our generals will tell you, in many places, too many places, it isn't." Success for the U.S. military effort, Kerry said, will come when Americans can "empower and transfer responsibility to Afghans as rapidly as possible and achieve a sufficient level of stability to ensure that we can leave behind an Afghanistan that is not controlled by al Qaeda or the Taliban." Achieving U.S. goals "does not require us to build a flawless democracy, defeat the Taliban in every corner of the country, or create a modern economy," he said. Kerry said increased development efforts could also help with counterinsurgency operations by winning the hearts and minds of the Afghan people, a strategy advocated by Secretary of State Hillary Clinton. The State Department said Monday it is on track to meet the goal of tripling its civilian staff in Afghanistan, from 320 in January to 974 by early 2010. Kerry echoed comments made in the past by Clinton, saying it was important for civilian workers to be protected with the proper number of troops. He also emphasized the importance of intensifying support and improving cooperation with neighboring Pakistan. "Given the balance of our strategic interests, it should give serious pause to military and civilian strategists alike that the current balance of our expenditure between Afghanistan, where there is virtually no Al Qaeda, and Pakistan, where there is, tallies 30-to-one," he said. Blasting the Bush administration for its "gross mishandling" of the war in Afghanistan, Kerry said the Obama administration was left with "no great options for its handling today." Still, he continued, "it was not a mistake to go in" after the September 11, 2001, terrorist attacks. "We now have to choose a smart way forward so that no one is ever compelled to ask whether we've made a mistake in staying," he said.